HARVARD COLLEGE. Broadside. List of Graduating Students and Theses for Disputation. Boston, Massachusetts: Richard Draper, 1770. 1 p., 18 x 22 in. 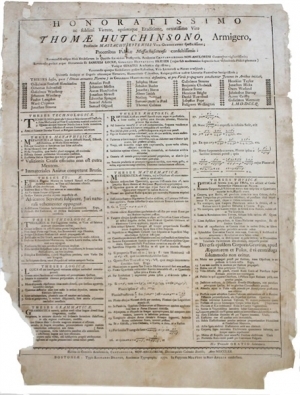 The Theses broadsides display propositions, used in the Commencement tradition of public student disputation which began at Harvard College in 1642. The practice was instituted under the leadership of President Henry Dunster (president from 1640-1654) within a larger effort to model the college after European universities. Behind the printed broadsides was a multi-stage process that involved both students and faculty. The Latin theses were academic statements created by the graduating students to reflect the scope of their undergraduate study. The Theses fit within a curriculum that emphasized public discourse and syllogistic debate and ranged between approximately 50 and 250 propositions in most years. This broadside includes theses in technology, metaphysics, theology, logic, grammar, rhetoric, mathematics, and physics. Printed at the expense of the graduating class, the Theses were posted in advance, and graduates were expected to be able to defend them upon request on Commencement Day. Certain students were selected by the faculty to discuss and dispute specific Theses publicly as part of the day’s exercises. Beginning with the first Commencement in 1642 through 1810, Theses were printed as broadsides. They were supplemented from 1791 onward by the Order of Exercises for Commencement, printed in English. The last Order of Exercises was printed in 1810, and subsequent Theses were distributed as quartos until they were replaced in 1821 by a Commencement program. Generally, the ceremony for students receiving their Bachelor’s degrees occurred in the morning and was followed by the Master’s degree ceremony in the afternoon. Thomas Hutchinson (1711-1780) was born in Boston and graduated from Harvard College in 1727. He served in the Massachusetts General Court from 1737 to 1739 and from 1742 to 1749. He also served as a member of the Governor’s Council and as a judge of probate and justice of the Common Pleas. He served as Lieutenant Governor of the Province of Massachusetts Bay from 1758 to 1771 and as Governor from 1769 to 1774, the first eighteen months as acting governor. In 1761, a new governor appointed Hutchinson as Chief Justice of the Massachusetts Superior Court of Judicature, which outraged many attorneys, including James Otis and John Adams. Hutchinson took an increasingly loyalist position, as Massachusetts and the other colonies asserted their rights and discussed independence. He traveled to London in 1774 to defend himself against patriot criticisms. He never returned to Massachusetts, and his properties, like those of other loyalists, were seized and sold. He wrote a three-volume history of Massachusetts, but the final volume was published after his death. Archivally backed and in very good condition, with areas of paper loss to edges.